In smack-dab in the middle of this nine volume set and wondering where things are going to go. I’m also wondering who says “smack-dab” any more, and whether it should be hyphenated or not. Wouldn’t you know it, it was the middle of this book that provided the pivot point for this epic story, almost structurally in the middle. I was fooled. Yeah, maybe I knew a little before this point, but not much. The beauty of how I was fooled is part of the point. I was fooled because the main character was fooled – hook, line, and sinker… so to speak. Let’s tear down the analogy of climbing a hill. The nearer the reader, and the main character, gets to the top, where the mystery unravels, the more complicated the mystery becomes. In fact, it’s really not a hill you’re climbing, it’s an iceberg, and there’s this deception that goes back decades that you can’t see, below the water line, and you have only a small indication of how huge it really is. That’s where we are, the tip of the iceberg, and we have no idea how big the rest of the iceberg is, nor how complicated the trek down the other side is going to be, thus prompting an insatiable urge to keep reading. However, I’ve squashed this urge to keep reading and I won’t pull out the next book for a while because it doesn’t seem healthy. I’ve read the first five books in the last fifteen months and I’m going to do some spacing because I need to get some non-fiction in. I have to break up the action. 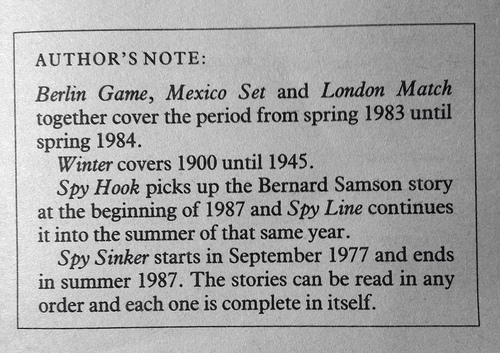 I did, however, peak at the next book and I noticed this little author’s note inside the front cover. I haven’t noticed a message of this sort in any other of the other books and it’s the first time I’ve seen it acknowledged that Winter is part of the epic (making it ten volumes). I’m also not sure I agree that each one stands alone. I get a lot of value out of the whole experience. That’s all for now. I’ll pick it up in a few months. Oh yeah, this reminded that I have to watch Tinker, Tailor, Soldier, Spy still. 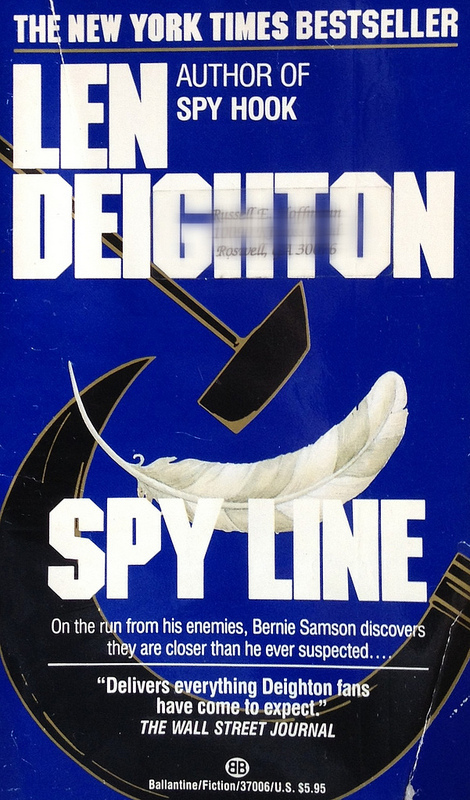 Posted in books, tagged pop-fiction, spy on 2013/03/26 by John.